Astronaut Mae Jemison’s biggest challenge isn’t in solving a calculus equation or finding the right chemical reaction. Instead, the task she finds most difficult is creating a better future. 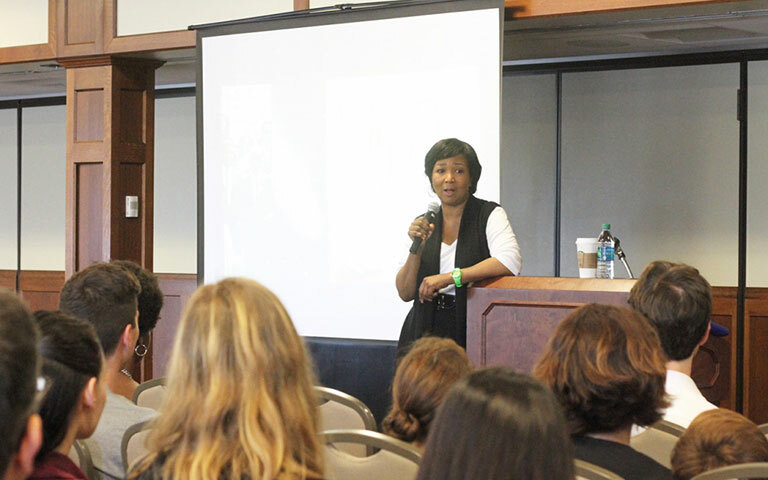 The Hutton Honors College and Kelley School of Business invited Jemison, the first woman of color to travel to space, to hold a discussion with students about how to improve Earth through the advancements in space exploration. She was named the business school’s 2016-2017 Poling Chair of Business and Government. Her project, 100 Year Starship, aims for this very goal. The group aims to create the technology available for interstellar travel within the next 100 years. Jemison said there are many aspects to consider with something so far-reaching, both in how we proceed with the advancements and how humans learn to cope with the change of lifestyle. However, those new ideas are worth pursuing for Jemison. “The way we move forward and push is by doing those things bigger than we think we can do,” Jemison said. She said she believes understanding the best choices for efficient, sustainable living in a spacecraft can ultimately lead to fixing technology on Earth. For example, instead of revolutionizing healthcare with the current practice of printing 3D organs, Jemison suggested scientists should look toward pioneering complete regeneration. “We have an opportunity to create the future,” Jemison said. Jemison’s optimism comes from growing up during the Space Race, in a time where she said she thought anything was possible. As a young girl, she always assumed she would go into space. As she grew older, she realized her perspectives as an African-American woman made her voice important in diversifying the ideas she has come across, not just at NASA, but through her business prospects as well. “It’s very clear that what happens in this world has a lot to do with who we are and who works on things,” Jemison said. Through 100 Year Starship, Jemison said she hopes to find solutions to problems faced by people on Earth. An emphasis on space travel will also help humans realize how connected they truly are, Jemison said. This will make more people focus on problems such as poverty, pollution and food insecurity instead of distancing themselves from the issues. “What we really want to do is inspire something that helps us see ourselves as Earthlings,” Jemison said. Hutton freshman Tsering Palzon said she heard about the event only hours before it was set to begin but knew she had to come. The topic was especially important to Palzon, she said. Although she grew up in Bloomington, her family is originally from Tibet, and she sees the way the country is currently struggling under the rule of China. To Palzon, Jemison is the perfect example of a woman who has it all figured out. In addition to her positions at IU and her career as an astronaut, Jemison served as Peace Corps officer, created a non-profit organization, was inducted into the National Women’s Hall of Fame and appeared on an episode of Star Trek, among many other accolades. “It seems like she’s managing to do everything she’s wanted in life, and right now I’m struggling to do my things,” Palzon said. Right now, Palzon hopes to go to medical school to become a doctor overseas after finishing her undergraduate career, she said. This is partly inspired by Jemison. From as far back as middle school science class, Jemison’s name has popped up throughout Palzon’s life. In high school, she read a few papers Jemison wrote, and many of her teachers were familiar with and fans of the astronaut’s work. Palzon said she especially likes that Jemison has also written books about science because the writing helps more people understand the big concepts Jemison deals with in her daily life. “It’s really motivational to see what she’s accomplished,” Palzon said.